How Does Social Media Fit In With Attraction Marketing? the method of putting value out into the marketplace so people in your niche, who you’d like to serve, will find it and be attracted to you. Hence, the term attraction marketing. I then told him that social media is just the tool that’s used to get your message out there. What Is Attraction Marketing Anyway? Attraction is chemical. People are attracted to people they think can help them and protect them. So, if you give people hope, they will naturally be attracted to you. With that said, you need to come up with a plan to solve people’s problems without pitching them your link to buy your product. Just giving someone a link isn’t valuable and it will not work! You wouldn’t walk up to a stranger on the street and say “Hi, my name is Joe and here’s my website…click it and buy product xyz from me”. Instead, you would go to networking meetings or social gatherings that you know will be attended by people who will definitely be interested in what you have to offer and introduce yourself. Then you would start a conversation with them to find out what they do, and how you may be able to help them. How Do I Use Attraction Marketing on Social Media? Once you find out (from them) what their pain is, offer them a solution that your product or service can provide to that problem. Once you solve their problem, they’ll love you! Remember, people don’t buy drills because they want a drill. They buy drills because they need a hole! Online (social media) is no different than offline. After all, we’re all human beings who are on the other side of the computer screen and keyboards that type the messages you see on Facebook, Twitter, Instagram, Pinterest, or any other social network you’re on. So, why would you go “walk” up to a stranger on any of those platforms and automatically “puke” on them. Excuse my language, but it’s true…it’s just like puking when all you do is post your link all over the internet? They’re called “Social networks” for a reason. People want to find out what their friends are doing. They don’t go onto Facebook to buy anything. If they wanted to buy anything, they’d go to eBay or Craigslist or something. The key to attraction marketing is that you want to enter into the conversations that people are already having in their mind. It’s important that you know who your target market is and you want to write down what your target market is thinking, what they’re searching for on the internet (via Google, Bing, or any other search engine) and constantly be putting yourself in their shoes before you put anything out there. But, how do I figure out what my target market wants, Jan? First of all, look at your product and figure out what problems it solves. For weight loss products, your target market is probably looking for a way to lose weight. For people in the home business niche, they may be looking for a way to generate leads online. Once you do that, you can search on Facebook, Twitter, and Instagram for those keywords. Another way to search for your target market is to target 20 MLM companies if you’re in the home business niche and do videos and blog posts specifically to them. Here, you want to mention the tools that you have at hand that can help them generate leads online. The know, like, and trust factor is the most important key to attraction marketing. People will buy from people they know, like, and trust. It has to be their decision. No one likes to be sold! Doing videos is a great way to allow people a way to get to know you. You can connect with me on my YouTube channel here. Make sure these videos have everything to do with your audience. Say how “You” can benefit and not how “I” benefitted. It’s all about appealing to their emotions. Once you’ve appealed to their emotions, you’ve successfully mastered the art of attraction marketing. I hope this blog post helped you and you got value from it. If so, I’d love to hear your comments below and if you feel the urge, please share with your friends on social media. Awesome attraction marketing post Jan. Attraction marketing is one of the most important strategies for all marketers who are creating a business online, and my all time favorite know, like, and trust generator is, like you said… through YouTube. Thank you for sharing. Thanks for stopping by April! Gotta love the 2nd largest search engine out there…YouTube! Thanks for this Jan. I to have to get into YouTube. Awesome post. You’re welcome Travis! You should take Mark Harbert’s YouTube courses if you haven’t done so yet. They’re great and he’s a great teacher. Fabulous post Jan! In my opinion, attraction marketing is the only true long term investment to build a business. Thanks Helene! I agree with you 100%! Thanks Ron. I appreciate you stopping by. Very nice discussion on Attraction marketing. It is far better to attract than to chase … and I believe there is an audience for everyone so there’s no need to chase… great explanations .. Yes, it’s so much better than chasing! Thanks for stopping by Lesly! Great post. I am a firm believer in Attraction Marketing. It seems like common sense to me. I do feel for those who do not know or understand about AM yet. They will learn by reading great posts like yours. Great info on how attraction marketing fits hand in glove with social media. People are desperately looking for someone they can trust to help them. Thanks Terri! I’m trying to show people that using social media really isn’t any different than meeting someone at an in person networking event. We need to all act accordingly and be real. I agree that people are desperately seeking this type of interaction with people online. I could always resist being chased by those I didn’t know at all but allowed myself to be convinced by those I thought knew what they were talking about. I was a beginner, lacking confidence and believed what I was told. I allowed myself to be worn down. It didn’t take me long to realize that those using this tactic weren’t doing well themselves. They just made it seem like it. They weren’t interested in helping either, so those they did bring in didn’t do well. They lost my trust. These days I have a totally different set of contacts. With the exception of one or two, they don’t try to pitch me but will honestly answer any questions I have about what they are involved with. I’m giving those “two” the benefit of the doubt for now. Sue, that’s what attraction marketing is all about. I’m glad you found 2 people that you trust now. Thanks for stopping by and commenting. 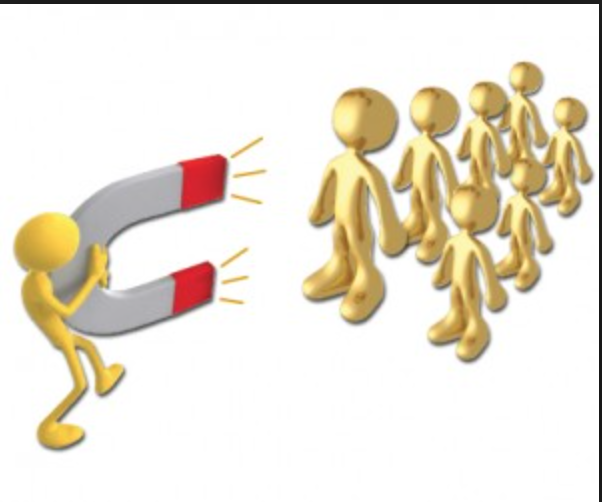 Fantastic post on the right way to do attraction marketing. I am a fan of law of attraction and your ideas of how to do the mlm posts is awesome. Thanks for stopping by and commenting Lawrence. I appreciate your visit. this is a very good post about attraction marketing and very helpful. Whoever wants to know how it works can get it nicely explained here. Thanks Erika! I’m glad you got value from my post! Great post Jan, love how you broke the topic down and made it simple. Glad you liked it Mike! Thanks for stopping by!